We are up and underway after a slap up breakfast and a warm send-off at ‘look mum no hands’, east london’s chic-est cycle spot. 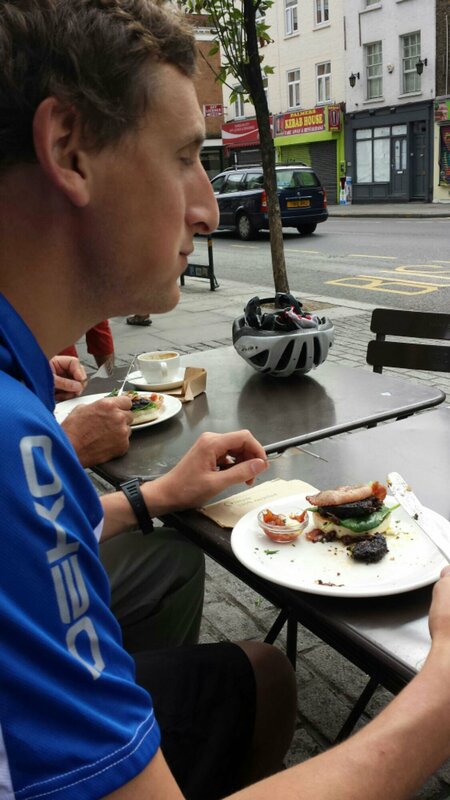 Ed enjoys a mouthful of stornoway's finest black pudding. Ooh arr. Lunch was a Weatherspoons special. The handy menu has the number of calories marked next to the dish so the choice is easy – go big! 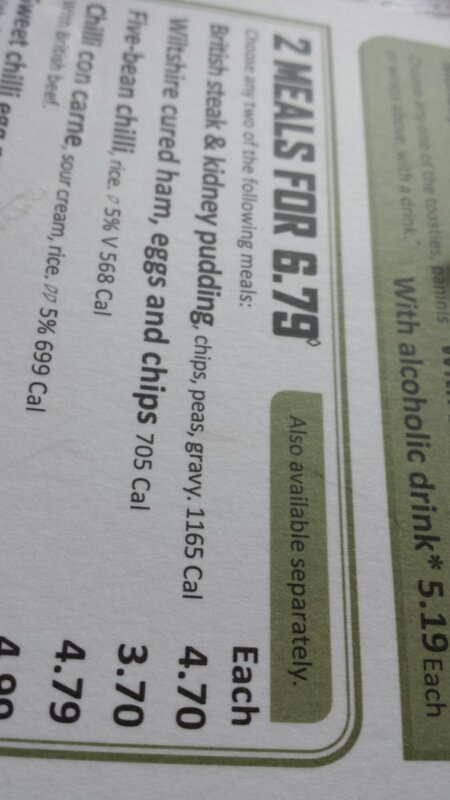 Steak and kidney pie has a delightful 1165. Onwards along the south bank of the Thames, Gravesend being our first afternoon pause. 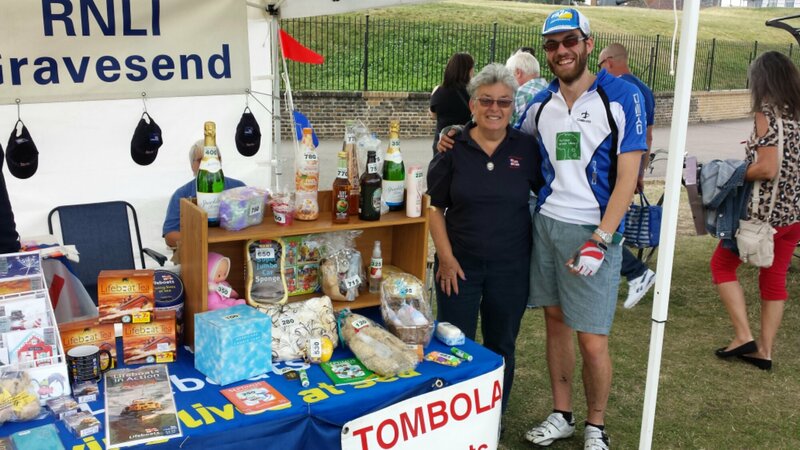 We met Nikki who chairs the Gravesend RLNI rundraising group and had a go on her Tombola. Our luck was in and we walked away with a pack of Polos. Minty fresh! We later steered inland to Gillingham, travelling swiftly through the beautifully sunny countryside. 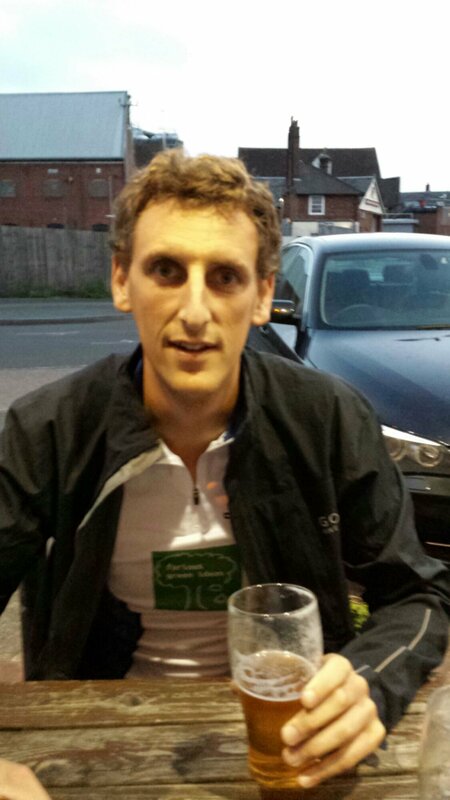 A few wrong turns followed before we stopped for a well earned pint in Faversham. A nightime search for a camping spot was perhaps not the most clever idea, though we were lucky to happen upon an idyllic setting on the edge on an orchard. 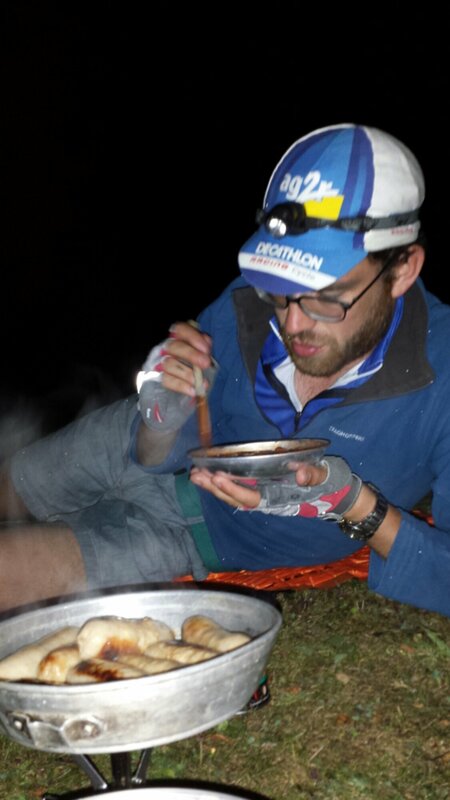 Food cooked and eaten it was time for bed – our first border crossing tomorrow! What’s five miles? About eight kilometres our metric friends would say. 8800 yards our parents would say. A perfect distance to cycle to work Sustrans would say. So to introduce Sustrans and their “Call to Action for 2020.” For our international readers, Sustrans is a British charity for which the last 30 years have been a constant campaign to improve the walking and cycling networks throughout the UK in addition to promoting sustainable transport. Today, the Sustrans cycle-ways allow a third of a million people to enjoy a daily traffic free commute to work. Their “Call to Action for 2020” has the specific goal of doubling the number of journeys under five miles made by foot or bike. Currently, us Brits jump in the car for nearly two thirds of trips under five miles and for one in five trips under a mile – not the healthiest of statistics. Sustrans aim to alter this ‘travel behaviour’ and are lobbying government to reward sustainability when awarding investment for new housing and travel infrastructure. Simple ideas like ensuring new housing estates are not built without schools so that families do not have to drive to educate their children; that there are doctors, shops and other vital amenities within walking or cycling distance and that walking and cycling routes are integrated into road building and improvement plans. It is a proactive rather than reactive stance. The charity’s Bike It scheme involves the education of children in the benefits of cycling to ensure there is a generation for whom cycling becomes the obvious choice for short journeys. Grass roots stuff hoping to inspire rather than coerce tomorrow’s commuters onto two wheels. For us at Furious Green Ideas, the work Sustrans are doing is both furious and green. Furious in the feverishly busy way, not the angry cyclist who has just seen a car stop in a cycle lane way (stay calm out there guys!). Please head to the Sustans Call to Action for 2020 page for more details (all facts and figures for this post were pinched from their More Haste Less Speed piece). As always guys, happy and safe cycling. A question asked by everyone we’ve spoken to about the trip. Cyclists are an often misunderstood bunch and excitement at the thought of cycling 4500km in four weeks with infrequent access to showering facilities seems a tricky concept to convey. So, I put the question to myself – what is the motivation behind the trip? For me it’s simple. I want to cross a continent under only my own propulsion. When put as simply as that, it sounds epic! With so many complications in modern day life, a stripped back adventure of pedalling 4500km unsupported and outside the constraints of tolls, traffic or timetables is, to me, the most appealing holiday I can think of. In addition, there is an environmentalist aspect. We are both keen to approach our lives with sustainability in mind, from recycling our beer bottles to re-homing some quite horrendous woolly jumpers! Cycle tourism is the ultimate in sustainable holiday making and something we hope to promote during our trip, both in the UK and more broadly in Europe. It is fair to say that the EuroVelo network is still very much in the development stages. The guys at the EFC are doing some monumental work to get a signed infrastructure up and running and it’s up to us the cyclists to get out there, use it, comment on it and help it develop into a fully operational European-wide network. It is a truly unique concept and makes our American and Australian counter-parts green with envy. A whole continent connected with criss-crossing routes which enable the two wheeled adventurer to visit some of the most spectacular sites in Europe is a tremendously desirable amenity. What’s more, the fact you measure the cost of your journey in miles per flapjack as opposed to miles per gallon of petrol means that it is an affordable means of exploring a country in these days of ever increasing fuel prices. And let’s face it – the price at the pump is only going one way. We leave in four and a half months and have a great deal to organise. We want to get in touch with cycling contacts in the various countries we plan to cycle through (a draft route can be found here) in order to promote EuroVelo in that particular country so please get in touch if you can be of any assistance. A more detailed route will be coming soon. In the mean time, happy pedalling!